Good luck to Allison Lemon, a brand-new graduate of Washington and Lee. This week, she is competing in the famed Roanoke Valley Horse Show, but it may be a long time before the former captain of W&L’s riding team sees the inside of a show ring again. As the Roanoke Times explains, Allison has been riding since she was 6 years old, and competing since the age of 12. At the end of this summer, however, the biochemistry major is headed to Wake University School of Medicine, in North Carolina. Time for riding will be scarce, and so she’s selling her beloved horse, Wally, which she has had for seven years, and preparing for the next phase of her education. Allison rides show hunters, and in Roanoke, she is competing on both Wally and on Rittani, a horse that belongs to a Bedford County trainer. She’s versatile in part because of her experience in intercollegiate riding. 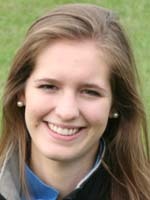 Allison was a member of the W&L riding team for all four years and served as captain for two years. She was an ODAC scholar-athlete each year of her college career. She is the daughter of one alumnus (Stephen Lemon, Class of 1984, a Roanoke lawyer) and granddaughter of another (William Lemon, Class of 1955 undergraduate and 1959 law, also a Roanoke lawyer and a former member of W&L’s Board of Trustees). Here’s hoping that the future Dr. Lemon and her horses win plenty of ribbons this week.